A new model of light wheelchair for the evolutive age which, in its standard configuration, includes some of the most important accessories. Excellent value for money. Typology: Light wheelchair with cross brace folding system for indoor and outdoor use. (standard) and flip-up and height adjustable tubular armrests (optional). Version with removable and height adjustable Desk armrests (free option). Angle and depth adjustable split footplate with heel strap. starting from 13.0 kg approx. 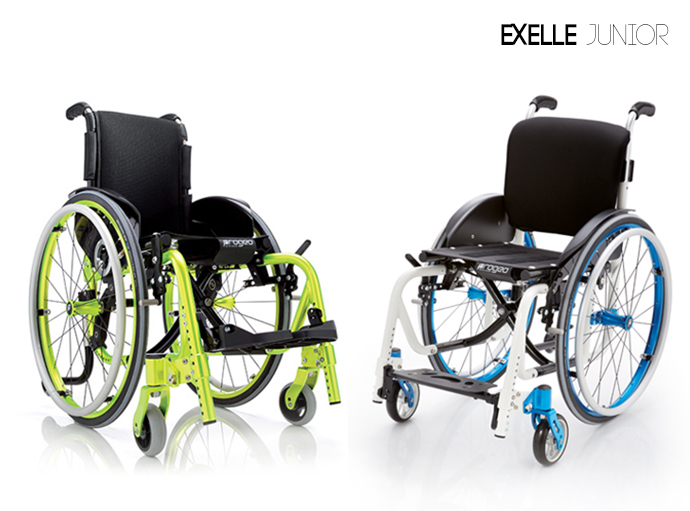 With Exelle Junior , Progeo redefines the children’s active wheelchair by focusing the attention on the innovative design as well as on the posture personalisation and allowing for the child’s growth. 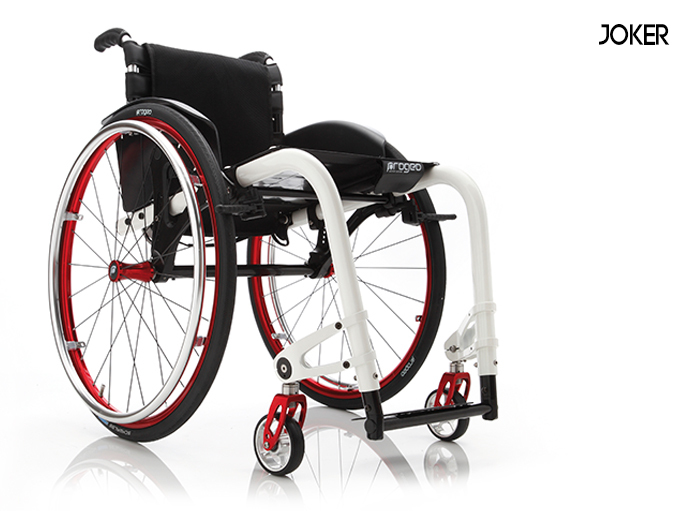 Tipology: ultra light wheelchair with cross brace folding system for indoor and outdoor use. backrest angle adjustment and mudguard with rotative adjustment system. Abducted front frame with split or one piece flip-up footplate. Wide range of front height keeping the same unit fork/wheel. Starting from 10.2 kg approx. 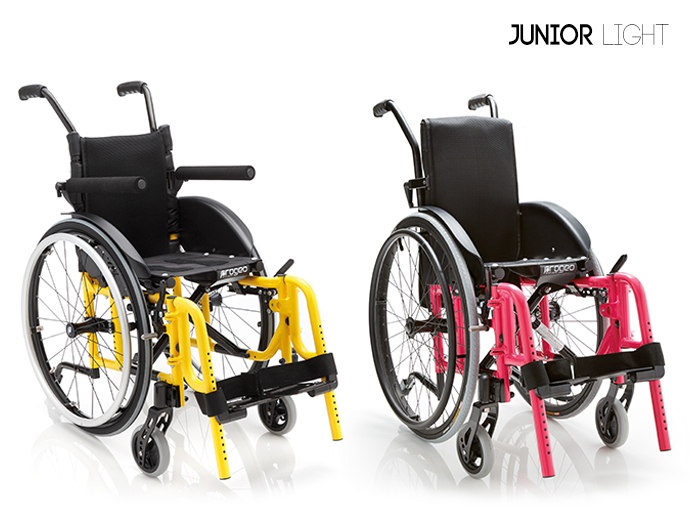 An ultra light active wheelchair that allows the child to express his/her own dynamism at best. 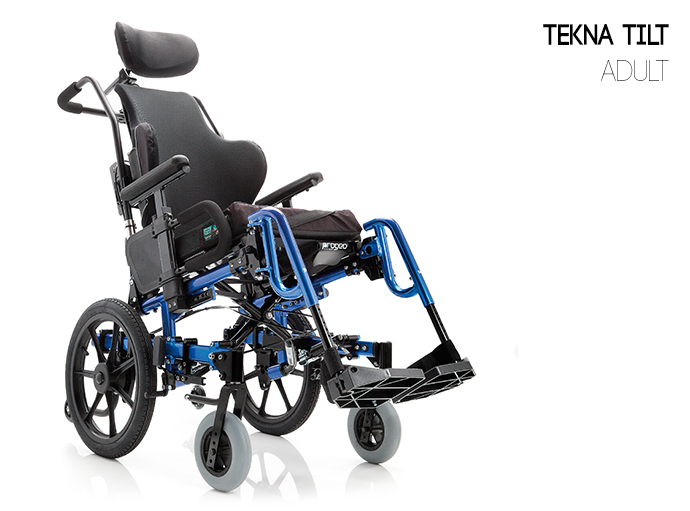 Tipology: ultra light wheelchair with rigid frame for indoor and outdoor use. Patented system with a new plate for rear height and setting adjustments and with removable mud guards as standard. New carbon fibre AIR backrest (optional), exclusive for the line of Progeo’s rigid wheelchairs. It approximately keeps the weight characteristics of the version with upholstery and it allows all adjustments for a optimal posture. Available with carbon fibre frame (optional). Sliding front height adjustment with fork with integrated spirit level (free option). Minimum encumbrance without rear wheels and folded backrest. One piece aluminium footplate (standard). Double footplate (optional) with front frame rigidizer. A very successful rigid frame wheelchair that never stops amazing. With ultra light aluminium alloy or carbon fibre elliptical frame tubes, its well known driving and lightness characteristics are even more enhanced in the 2014 version. Linear and aggressive, Joker uses innovative technical solutions for a full personalization. Introducing the Junior, part of our DB1 range. This chair can be made from both a single or double aluminium brace for choice in weight and added strength. The single brace keeps the customer safe and stable and is as durable as every other Greencare wheelchair, but if you want that added strength we reccommend the double brace. Rated for users up to 100kg, The Junior DB1 is a folding wheelchair built for the younger person which can easily adapted to accommodate growth or changing needs. 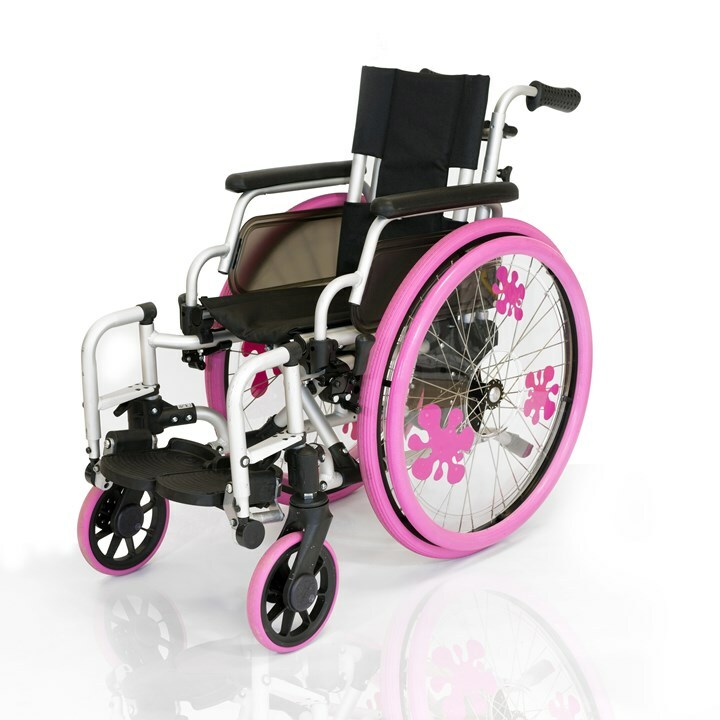 It can also be easily refurbished to suit a hospital/care enviroment and is the entry point to the full range of Greencare Accessories as it comes with custom coloured spokeguard and tyres standard on this chair! Designed from the ground up for kiddos, the TWIST encourages exploration, independence, and, yes, playfulness. There are no parts or growth kits to buy. Instead, the TWIST grows with you. The Tru-Fit system opens up the world of adjustability by incorporating an infinite adjustment mechanism. 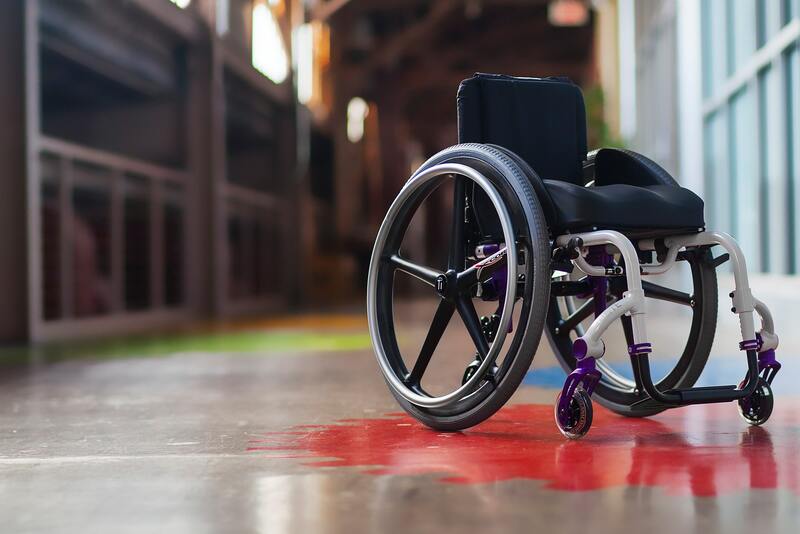 The Tru-Fit system allows you to fine tune the fit of your wheelchair because you are not limited to a series of pre-set holes. If your child is tired, a hill looms ahead, or you just feel like lending a hand, welcome to the TWIST Center-Mounted Push Handle option. Height-adjustable, and easily removable, the handle is there when you want it and not when you don’t. No growth kits required! The TWIST is ready to grow straight out of the box. Sized from 8″ x 8″ up to 15″ x 16″. 2″ of growth in seat width. 3″ of growth in seat depth. The 1″ aluminum frame design makes for easy installation of seating components.